We are going to take a brief detour from my posts about the trip to Washington, DC and the events of the week there to quickly describe the quick trip that I recently took to Anchorage Alaska. I had the privilege of speaking at the Fall Seminar hosted by the Anchorage Genealogical Society on Saturday October 8th. When I arrived on Friday afternoon, my host Russ Rudolph - 2nd Vice President and Events Chair - took me first to see the facility where the event would be held - The ZJ Loussac Public Library. I had the pleasure of seeing the marvelous things that the society was doing for the library and its patrons. There is a large area on one floor dedicated to shelves of genealogy reference books donated by the society each year for use by those people researching their genealogy. The society also has volunteers available a couple of days a week to assist library patrons in their research. 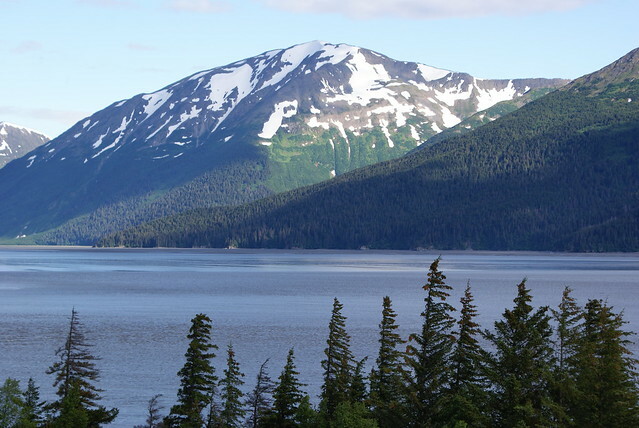 After seeing the library, Russ offered to take me on a drive down the Seward Highway to see some of the scenery. 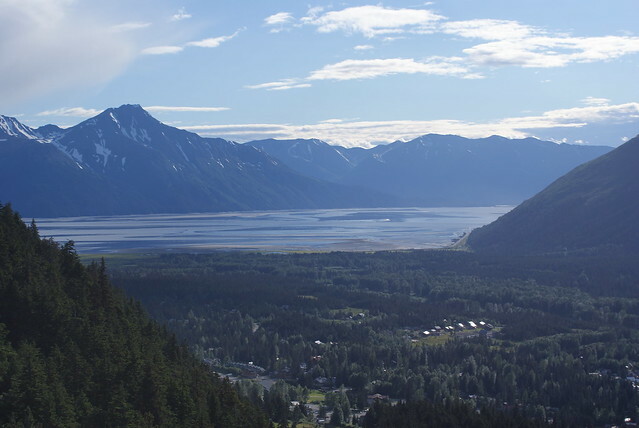 The highway makes its way south from Anchorage along the body of water known as the Turnagain Arm of the Cook Inlet. The overcast skies cleared off and on providing spectacular views of mountains topped with a fresh coat of snow and fall colors mixed with evergreens down low. Small waterfalls, creeks and rivers appeared regularly along one side and the inlet spread on the other. Our trip south ended at the town of Girdwood where we turned off to drive through the area known as the Alyeska Resort. There in that beautiful setting were steep slopes waiting for enough snow for skiers to be able to swoosh down the mountain. We came around a corner to spy tucked in the trees the main hotel/lodge where a large tram climbed slowly up a dramatic slope to a restaurant at the top of the mountain. After we returned, I then went back to my hotel. This gave me a chance to unpack, get a quick bite to eat, review my presentations and get some sleep to be ready for the next day's events. Saturday morning came and we headed over to the library to make sure things were ready to go for the 9 a.m. start. Patrons slowly trickled into the foyer of the meeting room and enjoyed various displays about genealogy put on by the society, and even a booth from the Pacific Alaska Region Branch of the National Archives, located there in Anchorage. The morning was made up of two class sessions with a short break in between. The first one was on organizing your research and various methods that can be used. I then presented a research case where I demonstrated a couple of specialized forms that can assist in helping to quickly see what you have found on the various surnames being researched and the records involved. Then after a lunch break where several participants stayed to ask questions and have a discussion on ways to share your family history, we were ready for the afternoon to begin. The society gave away several door prizes to those in attendance and yours truly picked the winning numbers. Congratulations again to the winners! The afternoon started off with a class where I presented many different ideas about the records where people can look to find the maiden names in their family tree or hints that might lead there. We ended the day with a presentation where I showed many different types things that can be found when researching in newspapers for information about one's ancestors or the places and events that were part of their lives. The society then surprised me with very nice gift bag including several momentos of Alaska and the products produced there. I had originally hoped to spend some extra time fly-fishing while up there, but my schedule didn't allow for it, so the society also included a fly box full of some beautiful flies tied by attendeee Stan Bissonette - who was planning to be my guide - and is also a talented fly tying instructor. Thanks again! 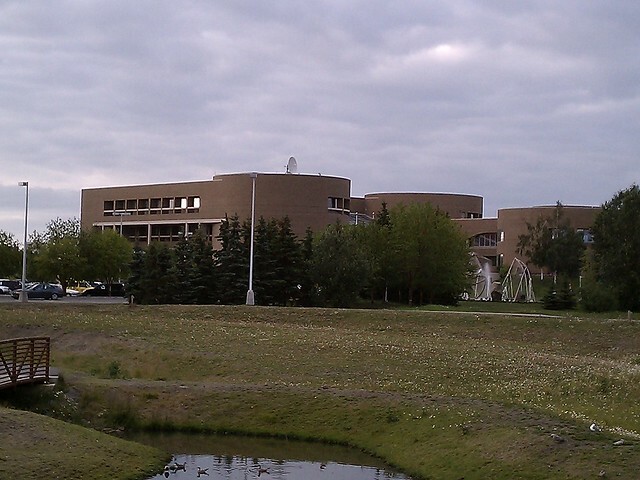 After staying to answer some questions and bid farewell to the attendees, Russ again took me on a quick tour of the downtown area and older/historic part of Anchorage. After a short break at the hotel, I was treated to a delicious meal at a local restaurant accompanied by the members of the AGS Board. We had a great time discussing genealogy of course - with a few minor tangents and personal stories thrown in. We just had a wonderful time and the company was delightful! We said our goodbyes and then Russ and his wife took me on a drive up one of the nearby mountains to see the lights of the city. It was a shimmering carpet of lights that seemed to go on and on until suddenly ending in the blackness of the water. 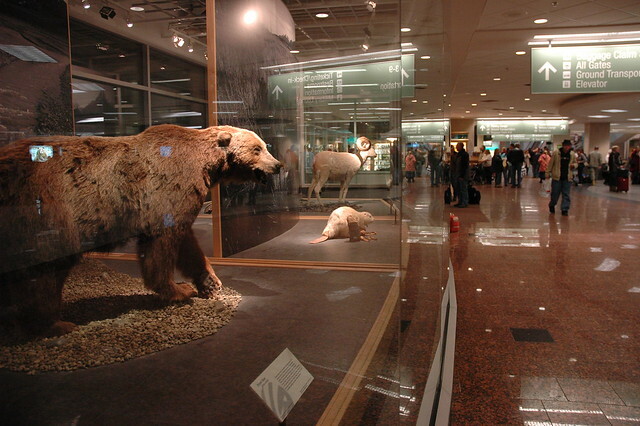 Sunday morning I headed out to the airport and enjoyed browsing the many displays of wildlife found in Alaska. It was a fantastic trip where I got to see glorious sites, meet great people, experience wonderful hospitality. I sure hope one day to get back there. I have to try those fishing flies out for sure!